If you are experiencing a life threatening crisis, contact 911 or go to the nearest emergency room. Tides of Life is open by appointment only. Call 317-398-8361 to schedule an appointment. 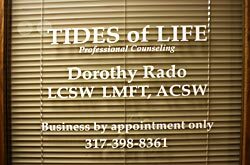 The best way to reach Tides of Life is to call the office at 317-398-8361 with questions or to schedule an appointment. If we are unable to answer your call, please leave a message. Messages are usually returned the same day. If a message or email is not returned within 24 hours, please try again as we respond to all messages--but at times technology does not cooperate (bad cell connections, spam filters and such) and we do not receive a message. Make sure to bring your form of payment (cash or check), photo ID and insurance card and a list of medications to your appointment. It is normal to feel a little nervous about your first appointment. Arrive 10 minutes early to complete the paperwork located on the waiting room table. You will then meet with your therapist. Together you will review background information and problems you want to cover and develop a plan to address your concerns. Appointments usually last 45-60 minutes. Your appointment time is reserved for you to help you resolve your problems. If you don't keep your scheduled appointments, you will not receive maximum benefit from counseling. If you are unable to keep your appointment, please contact the office 24 hours in advance so your appointment can be rescheduled. If you cancel at the last minute or do not show for your appointment you may be billed for the appointment time and/or asked to find another provider. In the case of emergencies, such as a Shelby County travel advisory, please contact the office to determine if it is open or to reschedule your appointment. Your Protected Health Information is kept private according to HIPAA, NASW Code of Ethics and State Social Work Confidentiality Rules. Generally, your written permission is required before information can be shared with others. Certain circumstances require the mandatory release of information such as reporting of suspected abuse or neglect of children/elderly, in a medical emergency, when someone is imminent danger to self or others and other applicable laws. Payment in the form of cash or check is expected at the time of service. Self Pay--Full Payment in the form of cash or check is expected at the time of service. EAP--Some employers offer free counseling sessions thru an Employee Assistance Program (EAP). Contact your Human Resource Department to determine if your employer offers this type of coverage. Notify our office before your appointment if you are approved for EAP benefits. Insurance--As a courtesy, Tides of Life can bill your insurance. You are responsible for the unpaid balance. Insurance coverage is complex and confusing. It is your responsibility to contact your insurance company directly to determine your coverage for outpatient mental health benefits. Please use the Insurance Checklist located on the Resource page. This will help you communicate and gather coverage information from your insurance company. Unfortunately, our services are not covered by Medicaid or Medicare. Services are covered by many other insurance and EAP providers. We would be happy to pursue joining new networks, please feel to contact the office with your request. Medication can be a valuable part of your treatment. We do not provide medical assessments, laboratory tests or medications. We suggest you contact your family physician or health care provider for a medication evaluation. "Tides of Life" is a metaphor for the daily occurrences we all face. Have you ever walked along a beach and noticed all the items the tide has washed up? Our life is similar; many things challenge us on a daily basis. Some of these are expected and easy to navigate. Others are unexpected and can create much pain. We are here to help you handle these in a constructive way. We offer a place for healing from the past, strength for the present and hope for the future.